We resolve to come together as a community that cares about Fremantle, to put aside decade old differences, and finally break the silos that keep us from achieving holistic, complete city-building. We resolve to set better goals, and better measure the RIGHT successes, rather than optimizing the wrong things. Smart density, not sprawl. Shorter, smarter trips, with everything we need closer. More parks and public places that more people visit, and stay in longer. The key is to be clear, and to honestly measure success over time. In many cases, we’ve been busy measuring the wrong things. We resolve to push for sensible transport investment in our region. It is tragic when the biggest single road project in Perth’s history – the freight link – will only encourage more freight onto roads instead of rail at the same time investment in public transport in our region is at a standstill. We resolve to address key social issues like mental health and homeless, not just because it’s the right thing to do, not just because it actually saves us money in the longer term, but because it diminishes all of us when these issues aren’t properly addressed. We resolve to stop using the eight most frustrating words in the English language – “we could never do that in our city!”. Great cities made good and often hard choices and stuck with them for years if not decades to see their benefits come to fruition. Lastly, we resolve to be not just involved in, but absolutely integral in, the broad conversation about the future of Freo. And at the same time, we all need to listen and learn a lot better. This list isn’t intended to be comprehensive. But I was inspired to share them with you because I’m inspired by the year we could have together, our community of people who love and care about where Fremantle is going and the broader leadership we can show. The best way for me to express my love for Fremantle is in photos, so I went through my files to create this Happy New Year photo essay for you all. May we have learned a few important lessons from 2014 and try not to make the same mistakes. May selfishness be replaced with empathy, judgment with tolerance, and may love replace violence. The year 2014 has been the year of akrasia, as there have been too many mind-boggling decisions made by our local and state governments. Stubbornness has crept into politics, where not many elected members seem to care about long-term implications of their short-sighted decisions. State Government keeps overriding local government planning decisions with little regard for the communities who do not want dramatic changes to the character of their suburbs and lifestyle. High density commercial and residential is the way forward no matter that office buildings in Perth and West Perth are empty and that Sirona Capital seems to be unable to sign up major tenants for the Fremantle Kings Square development. There is enormous competition from Joondalup, Midland, Cockburn, etc. but up we go and the DAP will just sign off on high buildings to please developers. Residential units are on average $ 80,000 more expenisve in Freo than when one buys them in Perth, so why bother moving to the port city when it costs a decent year’s salary more than elsewhere? The Roe Highway truck toll road is pure madness because it means all these fast-moving trucks will end up in long queues at North Fremantle. 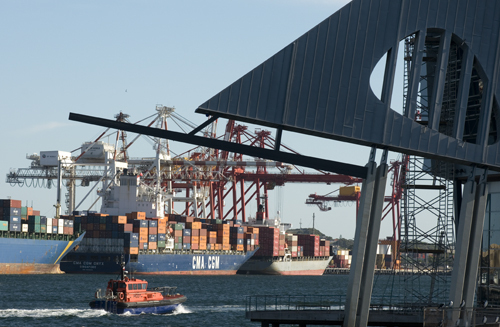 One has to ask also why Fremantle Ports built a million-dollar rail loop and extended the train terminal, when State Government wants to move away from rail and more containers transported by road. While State Government blames the drop in commodity prices for its bad financial state, fact is that W.A. lost its Triple A credit rating well before the price of iron ore dropped. It’s not just the low GST return that made our state be in the financial mess it is in, but basic bad decision-making is to blame. Instead of building light rail through north Perth and linking universities and hospitals we are building rail to the airport and a truck freeway through the Beeliar wetlands. Akrasia and stubbornness are the probable explanations for that. The Elizabeth Quay project and new Burswood stadium are other clear examples of that. Fremantle Council has been all over the shop with inconsistent decision-making. Community consultation is sheer tokenism, as especially the Malcolm Street decision showed, that will change the tight-knit community there forever. There is little respect for community sentiment and it is dismissed as NIMBY mentality. In February we will see the launch of Fremantle Transitions, but I have given up all hope that it will be of any substance after the lengthy Visioning 2029 project that ended with a rubbish document. The City of Fremantle has no real vision for the future and suffers from naivety and mediocrity. It makes little difference to produce new master plans and so-called integrated vision plans, when they are not outcome based. It’s all about making the community feel good about community consultation and gives and air of professionalism to what basically is a shambles. Let me ask some questions here: What is the City’s Plan B for the Kings Square development? What is the City’s vision to attract more tourists and give them more attractions? What is the City’s realistic vision to improve retail and make Fremantle a shopping destination again? Why did the COF sign off on a very expenisve new civic centre when it was known that East Fremantle would amalgamate with Fremantle and that the EF council chambers and administration offices would become available to the bigger City of Fremantle? I am all for looking after the planet but let’s be realistic about the impact on our economy of being a One Planet, Carbon Neutral city. Does any of it improve the plight of our local retailers, the homeless, those looking for affordable housing? The Fremantle community no longer believes it is listened to and those of us who consistently attend workshops are very disillusioned and believe we wasted our time, because against better knowledge the elected members will often vote against the wishes of the community. When elected members are on record saying that they are happy to extend community consultation on highrise at McCabe street in North Fremantle but that they will not change their mind on it, that smells of incredible arrogance that the community will not tolerate. The best outcome for Fremantle will be the amalgamation and that we can vote a whole new council in, a council that will hopefully have more common sense and vision for the future than the present one had displayed. To move Fremantle forward we need broad-minded visionaries without green goggles on Council who can see a realistic bigger picture for our city, so that’s my wish for Freo for the New Year. I wish all Freo’s View readers around the world a very happy 2015. The blog was read by over half a million people in 136 countries this year. I posted 1,252 posts up to now this year. This one is number 1253. It has been a labour of love for Freo, and your participation has shown you appreciate my commitment to the city I love and care about. It was very unusual to see so many people in Fremantle on a Monday. Normally during the first half of the week good old Freo looks a bit like a ghost town, but the festive season and school holidays made a significant difference today. The alfresco cafes were trading well and people were parading along the Cappuccino Strip like they generally only do on weekends. The Fishing Boat Harbour was also not deserted so the whole place had a really nice buzz about it. If only we could have that all year. It would make our retailers very happy. I thought this tabloid headline might grab your attention. : >) Of course I only mean the departure of the early morning ferry this Monday morning though that was packed full with people going to enjoy Rottnest Island. Rottnest Express is well and truly part of Fremantle and Victoria Quay and will be there for a very long time I hope. I must be suffering from holiday envy as I keep going to B Shed to watch the departure of the ferries in the morning. There is a real happy buzz about people going on a holiday and for some reason being there makes me feel happy as well. 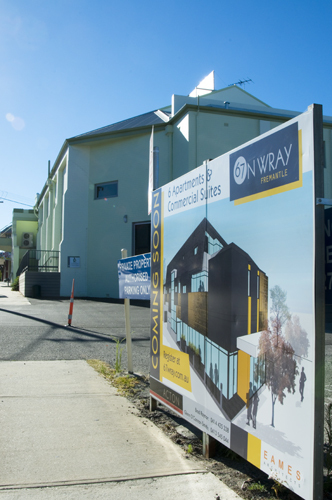 A modern three-storey building is planned in Fremantle for 67 Wray Avenue next to the newly-opened GP practice in the art deco building on the corner of Hampton Road. The mixed use building will house three commercial units plus six multiple dwellings. I hear the doctors are not too impressed about it as there will only be a narrow drive way for patient parking between the two buildings. The former VET cottage building next the proposed new building is also for sale. WOW! What an amazing music session that was at the Fremantle Arts Centre this afternoon. The energetic and fantastic TOBY got a standing ovation from the 1600 spectators who were packed in the lovely courtyard. Young and old were on their feet dancing to the roots and reggae tunes and Toby’s great voice.. It was one of the best Sunday afternoons at the FAC I have experienced and perfect for the end of the year concert. Great vibes, great ambiance, great music, great crowd. It was perfect on a perfect summer’s day. Since I started this FREO’S VIEW blog just over four years ago my aim has been to at least have one blog post each day about something related to Fremantle, so that the blog is always fresh. I probably have averaged three posts a day, but during the festive season that is becoming a bit harder. I took these photos this Sunday morning around the B Shed and Rottnest Island ferry terminal on Victoria Quay. There is not much happening in Fremantle this time of the year, so an early morning photo of Fremantle harbour will have to do. There were a lot of people hopping on the early Rottnest Express ferry, while along the river boaties were keen to get out on the water before the sea breeze comes in later. Developers with an S in their name appear to be the ones with confidence in Fremantle and willing to invest their money here. Sirona Capital has been involved with the Kings Square, Heirloom by Match, and Pakenham Street short-stay accommodation developments, but Gerard O’Brien’s Silverleaf Investments are giving them a run for their money. According to retailers in the Woolstores Shopping Centre O’Brien came to introduce himself to them last week and to let them know he had bought the property. Silverleaf already owns the Target Building and the one opposite where the new 7/Eleven just opened, and they have started on the development of the Atwell Arcade in High Street as well. I think they own a few more properties in Freo central. 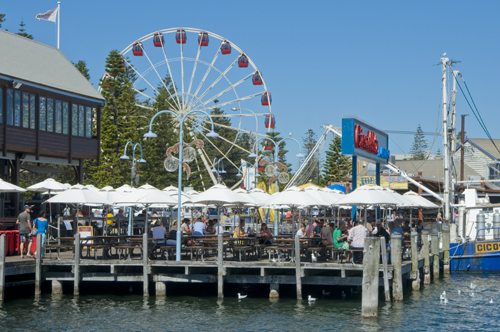 The big SALE day yesterday showed clearly that Fremantle no longer is a shopping destination, with the CBD almost deserted, while the Perth CBD and suburban shopping centres were overflowing with people. 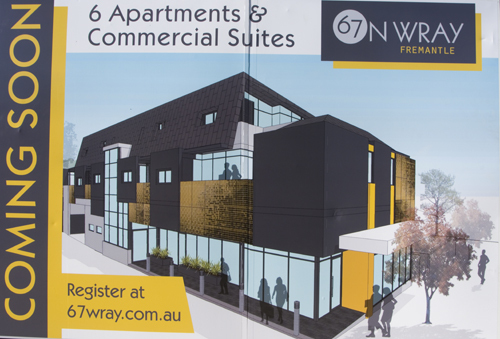 It is good to see developers wanting to revitalise the Freo retail market and office accommodation.